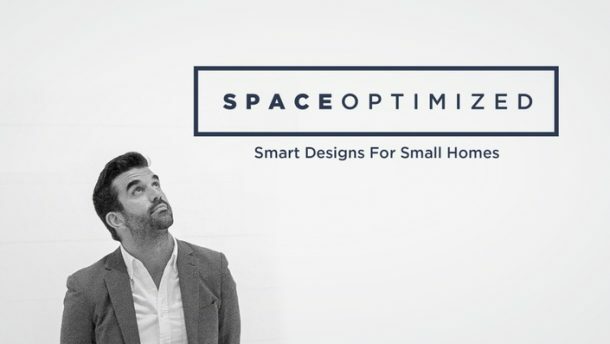 Does your rental home need an upgrade? 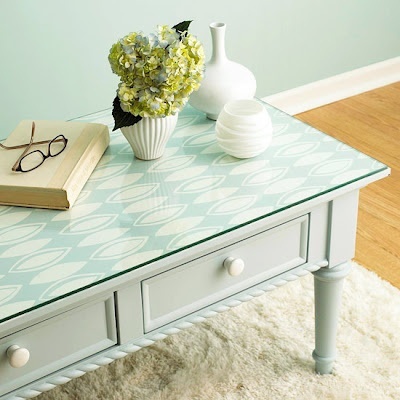 Instead of spending a small fortune on decors and new pieces of furniture, consider giving your existing furniture a makeover using wallpaper. If you think wallpaper should be strictly used to refresh tired walls, well, think again! 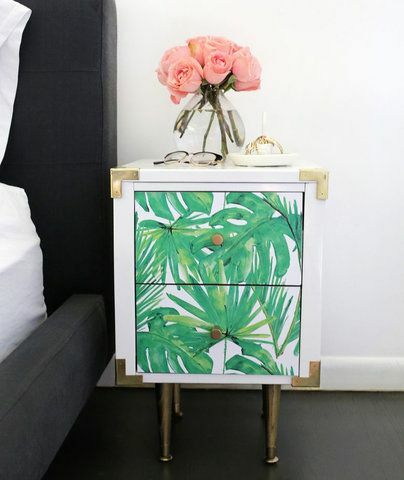 We’ve got lots of creative small apartment hacks to decorate old pieces of furniture and decors using wallpaper. Don’t throw away ruined, cheap, or unwanted artworks just yet. Give the frames a fresh coat of paint and stick cut wallpaper over the artworks and voila, you just DIY-ed your way into making new art! 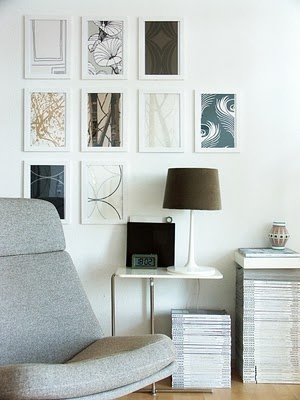 Hang your graphic artworks on any blank wall or lean it on your dresser to accentuate the space. If the idea of sticking wallpaper over old artworks does not appeal to you, you can always cut the wallpaper to your desired size and have it framed. 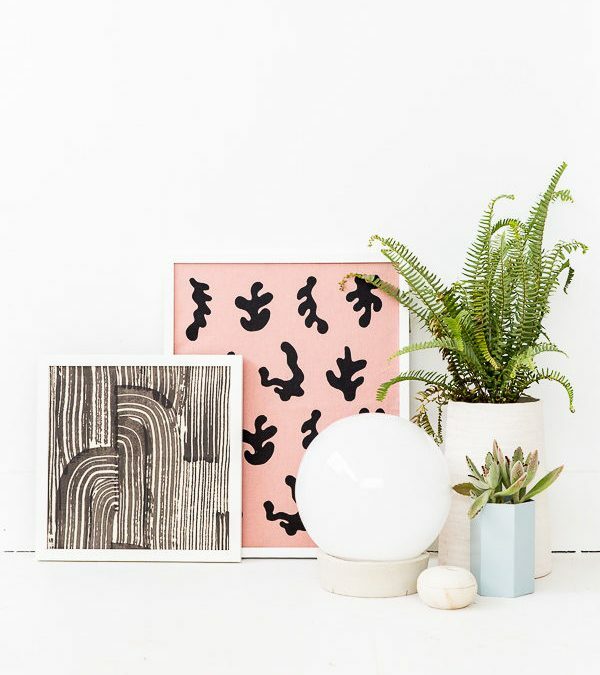 You can make several of these DIY artworks and use them to build a gallery wall art or as a tabletop display! 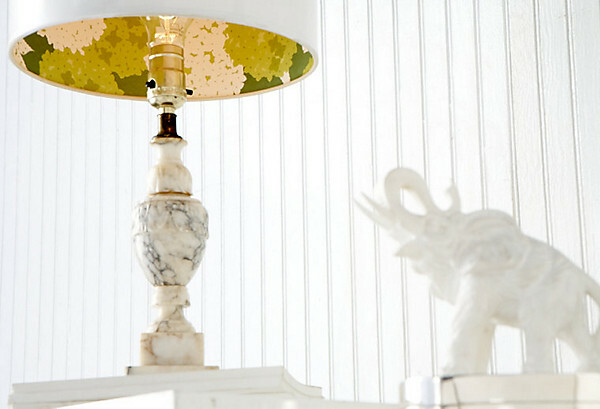 If your lampshades are too plain for comfort, you can add a dash of color or perhaps fun prints using bits of wallpaper! It does not take much to do it too! Just stick the wallpaper onto the inner lining of the lamp and you’re done. The fun part comes when you turn the lamp on, the print will show through the shade. You can check out this cool tutorial in case you’d like to turn this styling idea into a weekend project! Standard bookcase design is hardly exciting but you can use leftover wallpaper to give your boring ol’ bookcase a little upgrade! This is one of my favorite small apartment hacks because it’s like getting a new piece of furniture without spending a dime. There are several ways to use wallpaper to add interesting new detail to a bookcase. You can wrap the entire bookcase in wallpaper (if you have lots of leftovers wallpaper) or just stick pieces of wallpaper onto the bookcase wall for a pop of color! 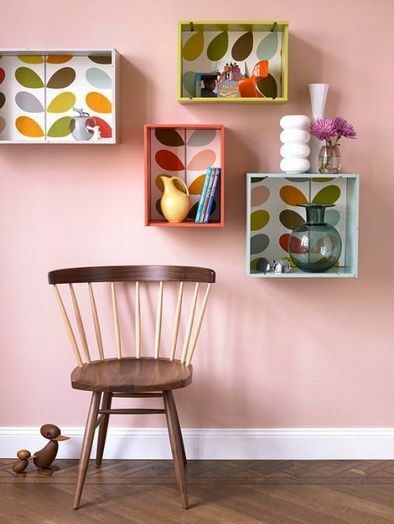 This idea is similar to the one above, just gather cut pieces of wallpaper and start sticking them onto the shelves to give your plain shelving a dose of color. You can choose to cover the entire shelves with wallpaper or use the wallpaper as an underside accent. On the other hand, if you’re using those trendy cube shelves, try sticking the wallpaper onto the backing of the shelves. 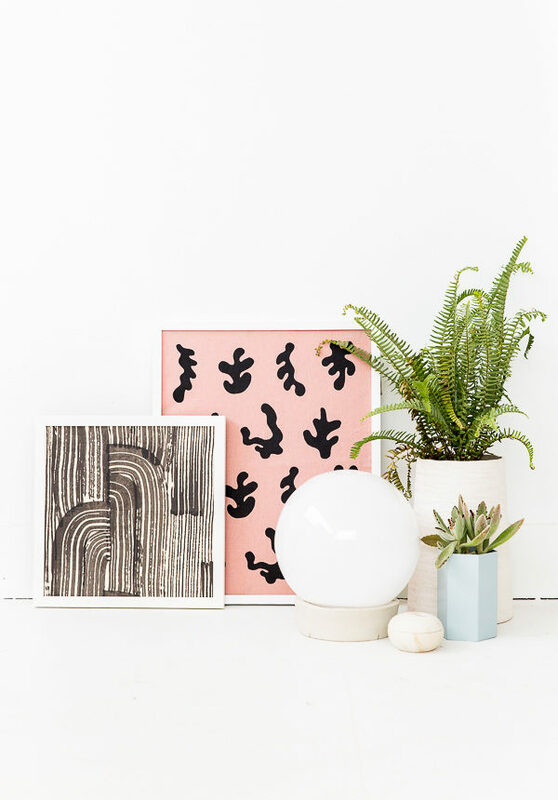 You can mix and match different colors and patterns to create a functional wall art! 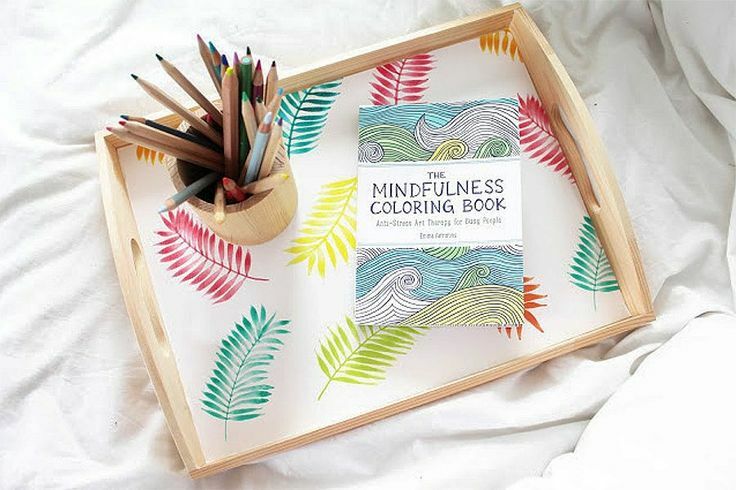 If your bedroom could use a little brightening up, try using colorful wallpaper to give your night table a pop of color. This is a great idea if say, your bedroom is drowning in neutrals or the interiors look plain and bland. Start by choosing an eye-catching wallpaper design and cutting the wallpaper accordingly. 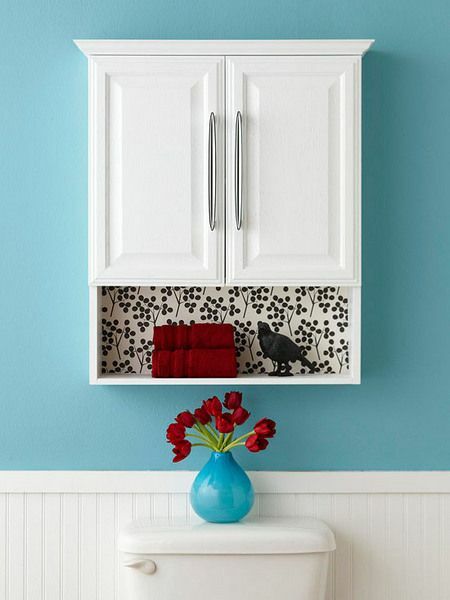 You can cover the entire piece with wallpaper or simply stick cut wallpaper to the drawers as seen in the image above! Apart from the night table, you can use wallpaper to dress up your headboard or vanity table for a mix of patterns and textures. That’s right, you can use small pieces of wallpaper to give plain or old serving tray a new look. Just cut leftover wallpaper into your desired shape and size and stick on a serving tray, that’s it. This idea works best for wooden trays. You can use your new serving trays to create beautiful centerpieces for the living room, dining room, or entryway. Want to give your fridge a fun makeover? Cover the entire fridge in wallpaper! It takes a little work to cover the entire fridge but trust me; the result will blow your socks off. In this tutorial, Aunt Peaches will show you how she gave her fridge a new “party dress” using graphic wallpaper. 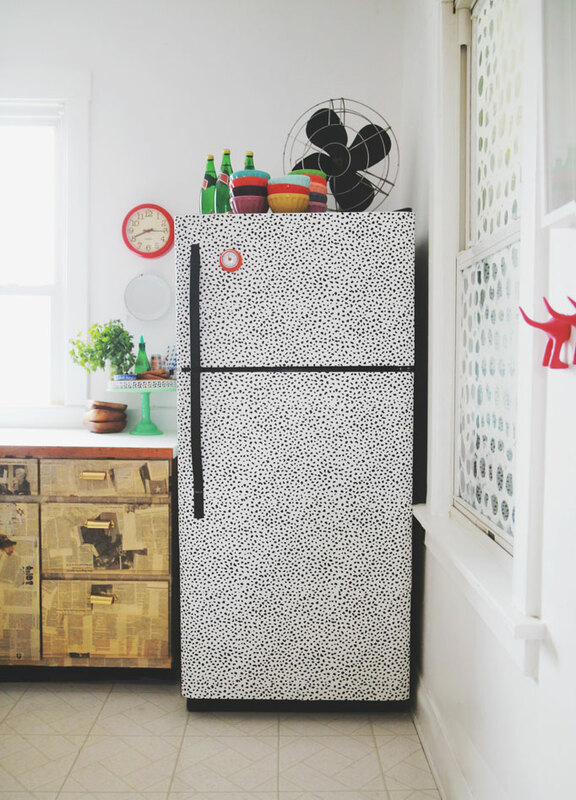 This idea is not limited to the fridge; you can use leftover wallpaper to cover other appliances, large and small. Wish your dresser shows your eclectic style? 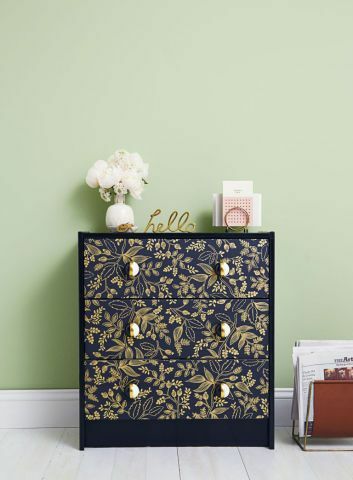 Turn any dresser into a conversation piece with wallpaper. You can either cover the entire dresser with wallpaper or just the drawers. Either way, the effect is truly eye-catching. You can use a single design for the whole dresser or mix different wallpaper designs to add color to your interiors. If your dining table needs a little sprucing up, you can use wallpaper to craft a beautiful table topper! Just stick the wallpaper directly on top of the table surface and hold it in place with a top sheet of glass. Easy right? The best part is that you can switch out the wallpaper whenever the mood strikes, giving your interiors an instant makeover! This is one of those small apartment hacks that could work with any type of table so go crazy! 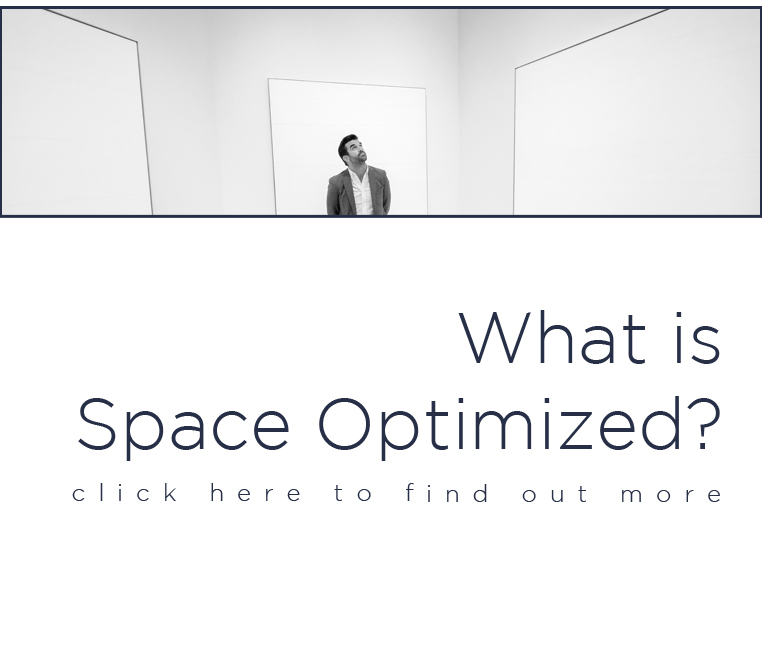 Is your plain stairway bothering you? 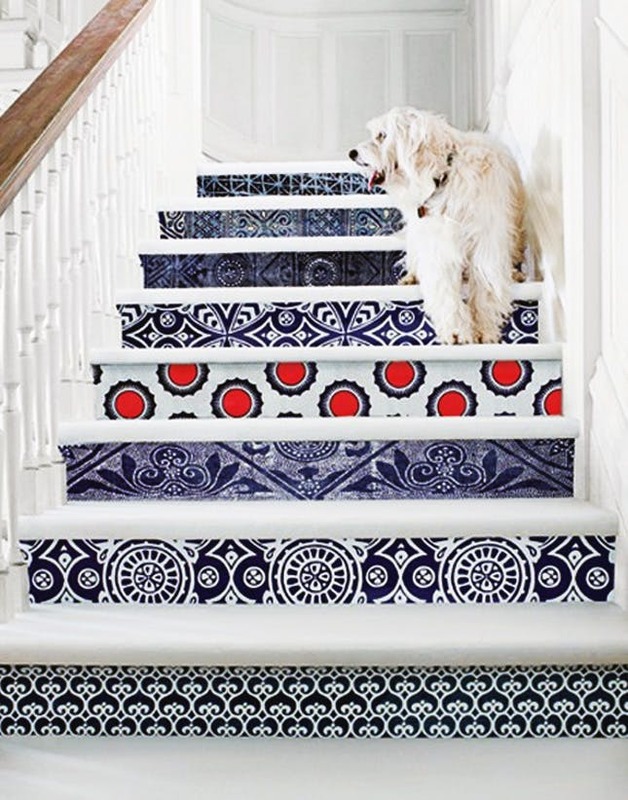 If you’d like to give your stairs a minor update, one that doesn’t require a ton of $$$ to pull off, try using bits of wallpaper to accentuate the steps. You can opt for a single pattern or go all out, experimenting with different patterns to make your stairway pop, as seen in the image above!